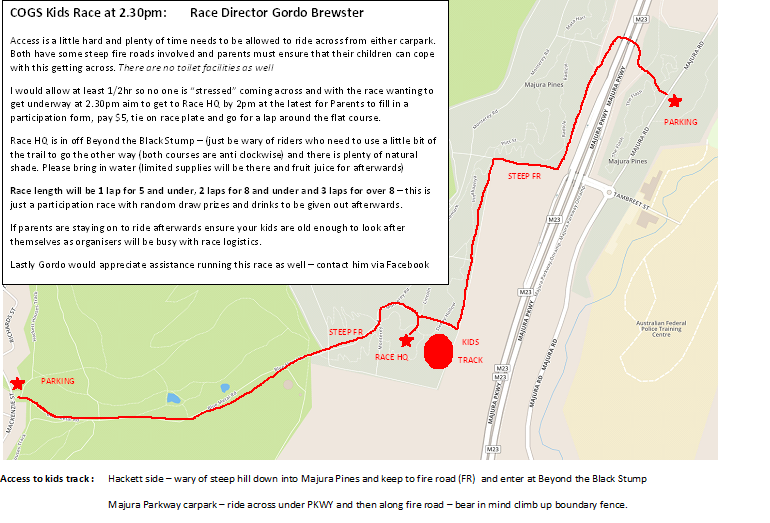 Majura Parkway carpark – ride across under PKWY and then along fire road – bear in mind climb up boundary fence. I would allow at least 1/2hr so no one is “stressed” coming across and with the race wanting to get underway at 2.30pm aim to get to Race HQ by 2pm at the latest for Parents to fill in a participation form, pay $5, tie on race plate and go for a lap around the flat course. Race length will be 1 lap for 5 and under, 2 laps for 8 and under and 3 laps for over 8 – this is just a participation race with random draw prizes and drinks to be given out afterwards. If parents are staying on to ride afterwards ensure your kids are old enough to look after themselves as organisers will be busy with race logistics. The Canberra One Gear Society is a ragtag collection of singlespeeders gallivanting the Nation’s Capital. We ride singlespeed because it’s a hoot.